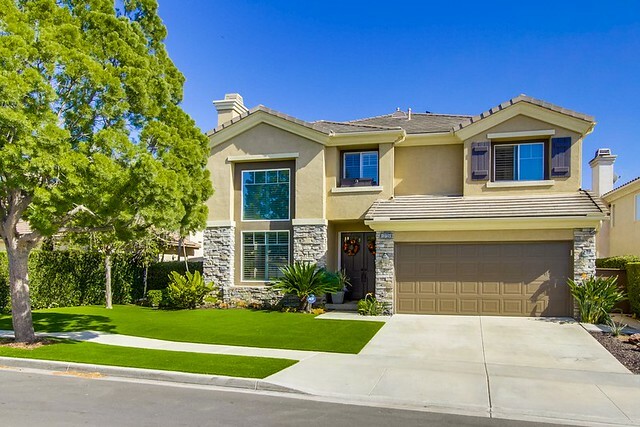 Gorgeous home located on a cul-de-sac in The Summit neighborhood of Carmel Mountain Ranch. Backs to open space canyon and offers fabulous panoramic mountain and city views.The serenity can be enjoyed from the below ground spa, patio or master bedroom balcony. Currently configured as a four-bedroom home, with fifth bedroom being utilized as a home office. Located in the Poway Unified School District with its outstanding schools. Easy access to I-15, shopping and services. Nicely xeriscaped property provides both excellent curb appeal and lower water usage. The leased 3.7 kw solar panel system helps reduce electricity costs. This beautifully upgraded home features a wide range of amenities. Tile and elegant distressed wood flooring can be found throughout the downstairs, with upstairs flooring featuring tile and carpet. Oversized baseboards throughout the home, along with warm custom painted walls create an inviting atmosphere. Dining may be enjoyed informally at the breakfast area, kitchen island or formal dining area. The kitchen features granite counters, stainless steel appliances, abundant storage and opens to the breakfast area and large family room. All bedrooms are located upstairs, with the master bedroom providing outstanding views of open space and panoramic views. Multipurpose backyard features barbeque, below ground spa, outdoor dining and entertainment area. The three-car tandem garage provides excellent storage as well as an electric vehicle charging station. John Lowe is an experienced buyer and seller representative having successfully helped more than 100 clients throughout San Diego County with their home purchases and sales. John was honored as a Five Star Best in Client Satisfaction agent by San Diego Magazine in 2011 for his dedication to his clients. Read more about John here.